Over/Under: Under 175.5 at 1.90 Bet Now! With both of these teams on a 2-1 record going into the fourth round of fixtures in the Euroleague, we are sure to get an exciting and interesting match. Both of these teams have a big pedigree in European basketball but they are both coming into this game after losing out on Tuesday night. It may be that the team that bounces back quickest will be the side that is most likely to win this game. Milan were in Greece on Tuesday night and they lost out 91-81 to Olympiacos Piraeus. This is the sort of result that many teams will experience in Greece, so there is no great loss to Milan but considering the Italians had won their opening two games of the Euroleague season, they went with optimism and confidence. Milan Macvan remains one of the better players in the side and if he is able to bounce back for this one, there is a very good chance that Milan will be able to get back to winning ways in front of their adoring public. Real Madrid suffered a home loss on Tuesday night, going down 87-91 to Baskonia Vitoria Gasteiz. There is always an added edge when domestic rivals clash in European action and Madrid have struggled in these games in recent times. However, there is often a lot to be said for having a quick chance to bounce back after a defeat and Real Madrid will look on this game in Milan as an opportunity. A quick look through the Madrid squad shows you that this is still a team packed full of quality players, and they should be achieving more than they did last season in the Euroleague. 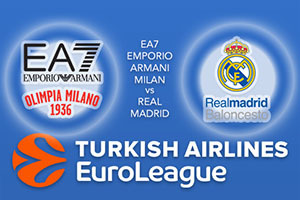 This game will be a good marker for both teams hopes in the Euroleague this season. The bookies think the Spanish giants will bounce back but it may not run that way. Milan have started the season in decent form and as they are at home, look to take EA7 Emporio Armani Milan at +5.5, which is available at odds of 1.90. You can find the Over/Under market going UNDER 175.5 which is on offer at odds of 1.90. Bet Now!